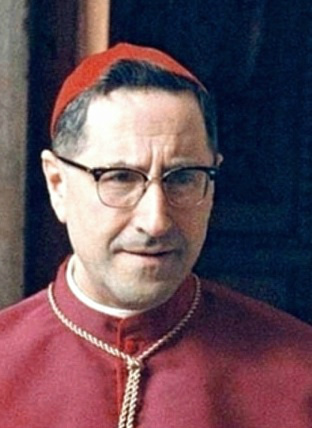 Cardinal Archbishop Giuseppe Siri (of Genoa) was 52 years old when he was elected and then forced into a Papacy in Exile (1958-1989). "My children, says Jesus, here is therefore My new representative placed in a position at the head of the Universe. A great deal will have to be suffered. Hell will launch a last battle against the earth; and the earth is going to launch an ultimate struggle against My representative. There will be a need for a man as strong as a mountain, and a mind out of the ordinary, to staunch such a revolution and such a slaughter.
" . . . the Roman Church will get acquainted with a form of its burial; but it will rise again. The Church is going to be a supulchre, a tomb of silence and [a] forsaken state. "Happy are those who will have faith and sufficient firmness to die rather than losing their baptism". (p. 58, The Prophecies of La Fraudais).
" . . . the Church will be deprived of the Supreme Chief . . .
"For a long enough period, the Church will be kept in exile from every prayer, from every service, in exile ... from His elect... . The foot prints of the saintly Pontiff, on the foot-piece of the altar, will be reduced to dust and ashes by the flames of Hell. "From the eyes of the Church, I see tears of anguish running down... . She will be delivered a prey to all scandals, to all desecrations. In several of its temples infernal decisions will be made, as if they were but plain houses, where the Lord can be outraged. ". . . the enemies of the Church have a design, unless they encounter an obstacle proceeding from Divine Power, which has not been extinguished, have a design to remove Saint Peter and Saint Paul from all the shrines where they receive their veneration. Their next project is then to remove all crucifix[es], all statues of the Saints, and throw them in a profane spot, or either to break them off after the most hateful manner. "They project to decree, on a day similar to this one (June 29) a law for priests to call them into a meeting to impose such law upon them and submit them to it." (p. 118, ibid). "Very strong attempts will be made against his life, and if he is not martyred at the hand of the barbarians, it will be because I will perform an astounding miracle on his behalf. "This dear and worthy representative will have joined in a new covenant to uphold My holy Church at the height of the storm. "Sorrows, tortures, contempts, he is going to get everything ... down to the spittles. They will even reach the point of leading him to the stone of the First Pontiff. They will tell him: 'Deny your faith, leave us with your freedom.' But his faith will remain steadfast and consistent. I will be the One who will have given such a Pontiff. Pray for him who is to behold, under his own gaze, a fierce revolution. Until death, his hand will keep hold of the Cross and will not leave it go." (March 9, 1878, pp. 218-219, ibid).